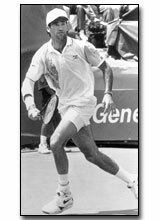 In 1980, Brad Gilbert won the United States Amateur Hardcourt Championship. A decade later, in January, 1990, he was ranked #4 in the World. For six years, Gilbert ranked in the World’s Top 20. And, for ten years, he was ranked in the World Top 35. Among his numerous court achievements: He owns 521 career Singles victories; has a U.S. Davis Cup Singles record of 10 wins-5 losses; has reached 40 career finals, winning 20 tournaments; and was the Singles Bronze medalist at the 1988 Olympics. At Pepperdine University (coached by SCJSHOF honoree Alan Fox), Gilbert was a Singles finalist in the 1982 NCAA Tournament. He turned professional in May of that year, and won his first professional tournament in October. In 1980-81, Gilbert attended Foothill Jr. College and won the California State Singles title. In 1981, he captured the U.S. Junior College Singles Championship. That same year, Brad (and Jon Levine) won the Doubles gold medal at the World Maccabiah Games in Israel, and took the silver medal in Singles. In March, 1994, Brad became Andre Agassi’s coach. Then ranked #32 in the World, Agassi’s ranking moved to #1 under Gilbert’s tutelage--and remained there for nearly a year. Brad is the author (with Steve Jamison) of “Winning Ugly”, an instructional tennis book.